Hope everything goes ok with finishing your semester, and specially, recovering from your wrist. I’ll be looking forward to both the all-age and 18+ patch! Anyone knows if there’s any preorder bonuses from Sofmap or other stores? The release date hasn’t even been announced yet, so it might be some time before they give info on any preorder bonuses. Thx for the info and for your work, and good luck with your real life projects! Thanks for your work on Kud Wafter, and all the best (=. Anyway, UTW apparently made a claim that it was revealed in Kud Wafter that Kud was raped in Tebwa. Can you confirm that this rumor is false ? From what I’ve read about the Kud Wafter manga, and considering the nature of the LB world, I suspect it’s pure rubbish, but it’s spreading like wildfire in the wake of the Anime-conclusion of the Kud Arc. Jyuichi says that Kud does not get raped. It’s just UTW making a joke, which wouldn’t be the first time, really. Nice, I have zero interest in the 18+ content so an all ages version is great news for me. Hopefully more info will be announced soon (such as a release date). 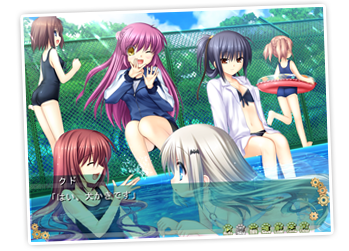 Cool news really, commonly these games are ruined by the spammage of H-scenes (*Looks to Tomoyo Atfer* need i say more? ), of course i intend to play both for full info but either way its nice to know they will make a all ages, which might have more content (to replace the mega H-scene count cuts). i d like to make kudwafter for onscripter but seems like seen.txt is hard to hack…. so i was making it by looking original game and type codes by my hand… It took me 1month to make first day of wafter section..
so what i need is hacked seen.txt… Can you send it to my email? i can send my sample for onscripter kud wafter..
My email is kamimoto0127@gmail.com thanks..
Didn’t I at-reply to you on twitter? Seems like my twitter is hacked … I cant see it..
Oops i found it . Sorry . Yeah, see progress page for more details. I’m in physical therapy for wrist injuries so it’s slow but I’m training Dragon NaturallySpeaking to learn the characters names so hopefully I can catch up soon. Thanks for all your work you put into this! No progress update since May even though you said that summer should be “steady”? Does that mean this project has been dropped for some reason(s)? take your time. i admit that i am very listless about the translation progress, but if it means for a swift recovery, i can wait.